The subject of statistical software fluency is an oft discussed topic round the brown bag table. The dominance of SPSS in social work has been discussed many times, sometimes controversially. Here at ICPSR I’ve heard a few things about software, my favourite being that number eight of the fabled ten commandments of the summer program was something to the effect of ‘don’t be a software snob.’ Also amusing is that this commandment has been wildly violated by many here this summer. It’s true all stats programs have their strengths and weaknesses. However, it must be said that some programs have shorter ranges and shallower depths than others. For example, SPSS and Stata often fall short in terms of graphical analysis and presentation. Each program has its strengths as well. In my scaling class this week, it was mentioned that the only reliable routine for unidimensional unfolding analysis is in SPSS. This was the first time SPSS was cited as having superior capabilities than other programs. 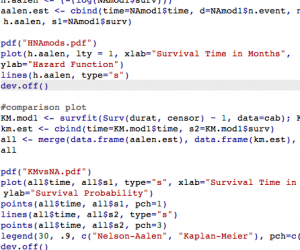 From what I understand, only one of the courses here utilizes SAS, and another utilizes the HLM program, while the rest rely primarily on Stata and R.
In my work here, I have mainly been focusing on becoming fluent in R, although I have learned a bit of JMP and expanded my Stata skills. 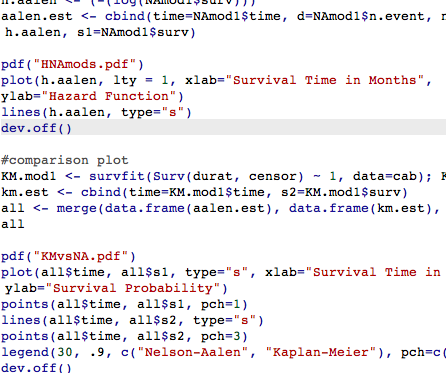 The R statistical computing environment is pretty incredible. Its breadth and depth are currently unparalleled. Many statistical techniques are simply not available in any other program. Even though it has a reputation for being difficult to use, I find the logic of the R language to be extremely straightforward. It does take longer to learn than other stats syntax for the non-programmer. But the way R forces an understanding of the moving parts of model estimation actually encourages greater understanding of the underlying math and logic to the statistics that far outweighs any labour costs. R has its more direct downsides of course, like any program. Tonight I ran into a parametric distribution that R did not support and I had to switch back to Stata. Also, I imagine that coding one’s work only in R poses challenges in terms of collaboration, particularly for fields that are dominated by other statistical programs. This afternoon, I caught one of my professors on the way out of class, and he stressed that one should ‘become bilingual.’ Indeed, learning programming languages is just like learning regular languages: more can very rarely be a bad thing. Published by Anne Blumenthal on August 1, 2013 at 12:47 am under Uncategorized. 1 comment. The first Global Health and Well-Being Conference hosted by NYU’s Silver School of Social Work took place last week, where I attended a session entitled “Trauma and Technology”. Both presenters gave excellent examples of how social work can use technology in research methods, proving that social work and technology don’t have to be odd bedfellows. Current sampling methods in crisis environments tend to use cluster sampling methods (most notably Les Robert’s approach of cluster sampling to determine the civilian mortality rate in Iraq after the US invasion). Building upon these sampling techniques, which certainly have a risk of inflated numbers, Professor Royce Hutson from Boise State University presented his work on random grid sampling, which uses statistical properties of estimators to determine population density and randomly select a particular building within that population. This results in a bigger sample size leading to better estimates. Marion Lok from University of Melbourne presented her doctoral research on use of crisis informatics in social work. She used technology to actually determine how people use technology is disaster. She found that people not directly affected by particular natural disasters in Australia and New Zealand had higher perceived risk than those who were directly affected. This may be because those who were directly affected did not have access to the internet. Lok’s presentation made me wonder, what are the implications for media creating more problems during emergencies? So, I really like the idea of integrating technology into social work, especially through research methods. In fact, I tried to do this with my use of GPS with Palestinian children and families. I think this is a promising direction for social work research. What do others think? Published by Bree Akesson on June 28, 2013 at 3:59 pm under Uncategorized. 0 comments.